Introduction to Architect Kobi Karp: 6:03 min. Photo: Robert Zuckerman. 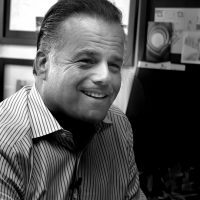 Kobi Karp (b.1962) is the founder and principal of Kobi Karp Architecture and Interior Design, Inc (KKAID). Karp founded the firm in 1996 and has been the Principal-in-Charge of design since that time. KKAID is a full-service architectural and interior design firm providing an array of services, ranging from the design of large-scale, high-rise condominium and hospitality projects to intimate, small-scale low-rise residential and commercial structures. Educated at the University of Minnesota’s Institute of Technology, Karp earned degrees in both Architecture and Environmental Design. Karp began his architecture career working on major hospitality and all-inclusive resort projects throughout the United States and the Caribbean. His restoration design techniques have contributed to a renaissance in the Miami Beach Art Deco District, which received international recognition. Karp has developed expertise in design over the last 20 years, working with a wide range of project types, sizes, complexities, and budgets. It is through this last quarter century working in warm weather climates that KKAID has garnered international acclaim and been selected to spearhead numerous resort projects. Developers and builders in the Caribbean, Black Sea region, and the Middle East have relied on the Firm for its design and planning capabilites. Karp is a recognized member of the American Institute of Architects, honored for his award-winning designs and buildings, and he is a licensed Professional Architect in 9 states and in Abu Dhabi (UAE). His Firm has been featured in national and local publications, based on their major contributions in the preservation of historic areas. The videos below are organized by topic and run between 60 seconds and 6 minutes. Click on any video. You must be connected to the Internet to view the videos. When you were studying environmental design in college, how was that defined in those days? You have worked all over the world, including the Middle East. Has being born in Israel caused any problems? INSIGHT & INSPIRATION: 3:29 min. Were you ever interested in any career other than architecture ? Did you take traditional art classes in addition to architecture classes? EXPOSURE TO BROAD INFLUENCES: 3:34 min. Who were your role models and influencers? DEVELOP A VOICE: 3:51 min. When you arrived in Miami in 1988, did you have a sense that Miami was on the verge of massive revitalization? UNDERSTANDS THE AUDIENCE PERSPECTIVE: 5:39 min. What were some of your early projects in Miami? INSIGHT & INSPIRATION: 4:21 min. Morris Lapidus had such a big impact on Miami in the mid-20th century. Talk about the beginnings of The Surf Club project. What are some of the unique problems you faced on The Surf Club project? You seem to have an affinity for collaboration with other architects. STRONG DRIVE FOR ACHIEVEMENT: 1:47 min. What advice would you give to young people wanting to be architects? OVERCOMES CHALLENGES TO SUCCEED: 3:02 min. Describe a challenging situation with a successful outcome.